In September 2012 the early music ensemble Cantus Modalis made a most special recording in Ostönnen (Westphalia). In addition to a praeambulum by Adam Ileborgh van Stendhal and music for Easter by Guillaume Dufay, Josquin des Prez and Fridolin Sicher, the pièce de résistance was the six-voice Missa Paschalis by Heinrich Isaac (ca. 1450–1517). 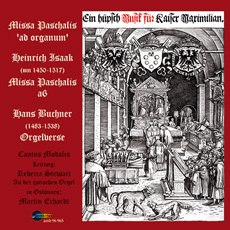 In this so-called ‘alternatim’ mass, Isaac’s polyphonic setting of sections of the Gregorian ordinary chants from the Graduale Pataviense for the Easter season is heard antiphonally with organ intabulations of the adjacent phrases by Hans Buchner (1483–1538). The organ chosen for this recording is the Gothic organ, originally in the Old St. Thomas Church in Soest (Westphalia). This organ, now in the small Protestant Church of St. Andreas in the village of Ostönnen, is one of the three oldest restored organs in the world, of which more than half of the pipes, the bellows and part of the case date from the first period of the organ’s history, 1425–1500. For this recording, Cantus Modalis, directed by Dr. Rebecca Stewart, was composed of six women ‘pueri’ and six men ‘clerici’, with Martin Erhardt as ‘organista’. The extensive background information, chiefly researched by Dr. Klaas van der Heide, a specialist in the area of iconographic symbolism in the famous Alamire choirbooks, is almost as exciting as a ‘whodunit’. Constructed around the symbolic content of the ‘advertisement’ woodcut of Hans Weiditz, which was produced for the last Diet of the Habsburg Emperor Maximilian I (1459–1519) in Augsburg in 1518, this narrative traces the fascinating role which Isaac’s six-voice Missa Paschalis played in the survival of the Empire, with as pivotal points the unexpected death of the Emperor’s son and heir, Philip the Handsome, in 1506, and the Diet of Constance in 1507.